Calcutta: Economics lore has it that Joseph Schumpeter had set three goals in life: to be the world's greatest economist, Austria's greatest horseman and Vienna's greatest lover. The Austrian-American economist apparently accomplished two of the three missions but never said which two, other than offering a clue by hinting there were too many fine horsemen in Austria. A fourth goal - unrecorded by the late economist but no less ambitious than the other three - has now been met: Narendra Modi's party has made Schumpeter a partner in the Prime Minister's demonetisation brainwave. "Four years ago we inherited a crumbling, corrupt and crony capitalist economy. We had the challenge to turn it around. The Prime Minister undertook the task of setting its basics right. It called for some harsh action, the kind that the Austrian-American economist Joseph Schumpeter called 'creative destruction'," read the "resolution for New India" that was unveiled in the presence of Modi and BJP president Amit Shah on Sunday at the BJP national executive. 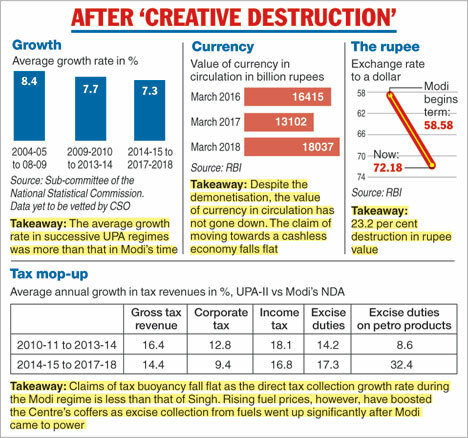 Among the exhibits listed in the BJP resolution as evidence of "creative destruction" are the demonetisation and the goods and services tax (GST). The resolution has left several economists bemused, not merely because it was reported that several parts of the document, including the reference to Schumpeter, have been lifted word for word from an article BJP leader Ram Madhav had written in a newspaper in July. "This is an insult to all students of economics. I don't know how the international community would react to it," said a former chief economic adviser to the government, who did not wish to be named.